Hello, Friends Today we are sharing one of the biggest NEWS of 2018 for blogger users. Last year blogger started to allow Blogspot blogs to use SSL certificate on their blogs. But that support was limited to Blogspot users and they promised to add the support for custom domains too. Now blogger has fulfilled their promised and has now supported SSL/HTTPS for custom domains too. With just two ticks your blogger blog will migrate to HTTPS secure version and also Google said HTTPS is also a factor for SEO considering this it will little boost your site SEO and SERP. Let's discuss the advantages of using it on our blogs. Advantages of SSL Certificates Why to use it in Blogs? Yes, Right Blog will become more secure as a secure connection between visitors and blog will establish when a user opens a post on your blog the connected will be encrypted. Like we said above adding SSL certificate will boost your site SEO and improve your blog SERP ranking on Google, Bing and Other Search Engines compare to non-https blogs. Yes you heard right your blog will become a professional blog as it will have a valid SSL certificate and all the security measures will be present in the professional and paid blogs. SSL Certificate is Free so why not to add? 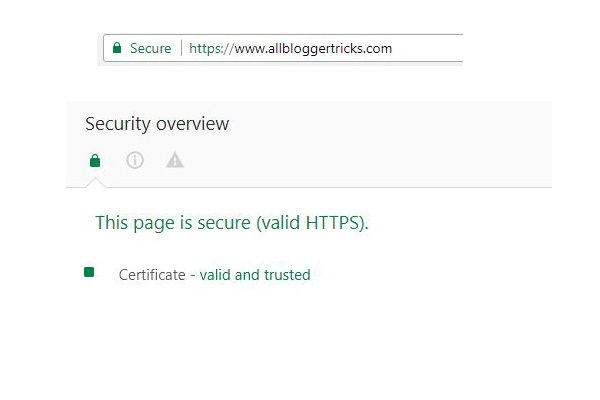 Blogger is giving us this SSL certificate Free without charging any penny so why not use it and get all the above benefits. From last year we were seeing other platform users like Wordpress etc they got so many benefits so now Google Started to give this similar benefits so why not use it. Now let start adding the HTTPS to our sites this process involves 2 ticks :P yes this is so simple, easier than chopping slices of apple. STEP 2: Go to the basic of Settings Then you will see a separate HTTPS Section as shown in the image below. STEP 3: Now change the HTTPS Settings to Yes as shown in the image above and follow it. Click on the image to enlarge it and see clearly. STEP 4: Now change the HTTPS Availability Settings to Yes. Now it will take few minutes for the process to complete. STEP 5: waiting few minutes after switching on the HTTPS Redirect switch the HTTPS redirect to yes this will force to redirect non-https pages to https.